Bass died in a hospice in St Louis, Missouri, of complications from a heart attack suffered three weeks ago, her daughter, Neuka Mitchell, said. She had also suffered a series of strokes over the past seven years. "She was an outgoing person," Ms Mitchell said. "She had a very big personality. Any room she entered she just lit the room up, whether she was on stage or just going out to eat." Rescue Me has been covered by many top artists, including Linda Ronstadt, Cher, Melissa Manchester and Pat Benatar. Franklin eventually sang a form of it - as Deliver Me in a Pizza Hut TV ad in 1991. Bass was born into a family with deep musical roots. 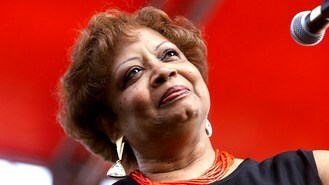 Her mother was gospel singer Martha Bass, one of the Clara Ward Singers. Her younger brother, David Peaston, had a string of R&B hits in the 1980s and 1990s. Peaston died in February aged 54. Bass began performing at a young age, singing in her church's choir at the age of six. Her interest turned to R&B when she was a teenager. She eventually auditioned for Chess Records and landed a recording contract. Her duet with Bobby McClure, Don't Mess Up A Good Thing, reached No 5 in the R&B charts and No 33 in the Billboard Top 100 in 1965. She co-wrote and later that year recorded Rescue Me, reaching No 1 in the R&B charts and No 4 in the Billboard pop singles chart. Her powerful voice bore a striking resemblance to that of Aretha Franklin, who is often misidentified as the singer of that chart-topping hit. Bass haggled over royalty rights to Rescue Me for years before reaching a settlement in the late 1980s, her daughter said. Bass lived briefly in Europe before returning to St Louis in the early 1970s. She recorded occasionally, including a 1995 gospel album, No Ways Tired, which earned a Grammy nomination.